These were the words of Luke Mayville, an author and postdoctoral fellow at the Center of American Studies at Columbia University, exhorting an audience of about 40 to action. 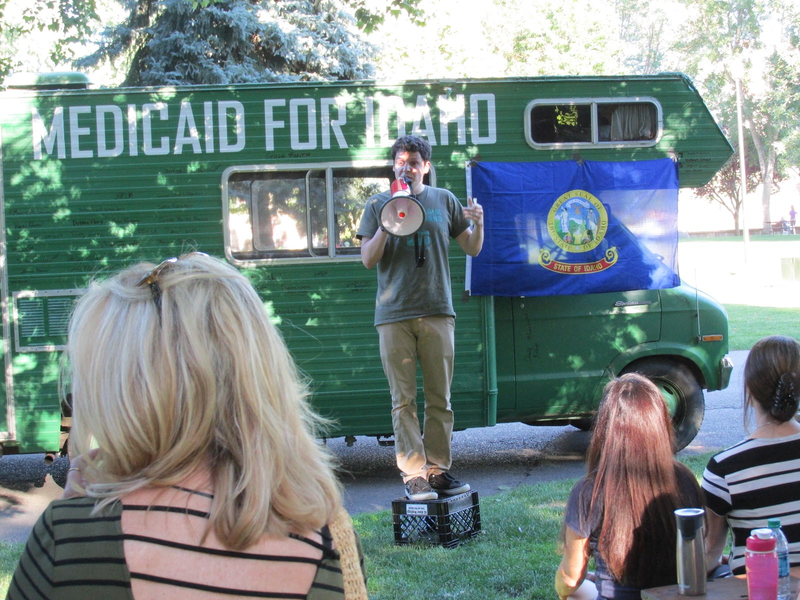 Mayville shouted into a megaphone while poised atop an overturned milk carton between a tree-green 1977 Dodge camper decked out into a “Medicaid Mobile.” The audience gathered in the Coeur d’Alene park to hear Mayville speak about the Reclaim Idaho campaign. 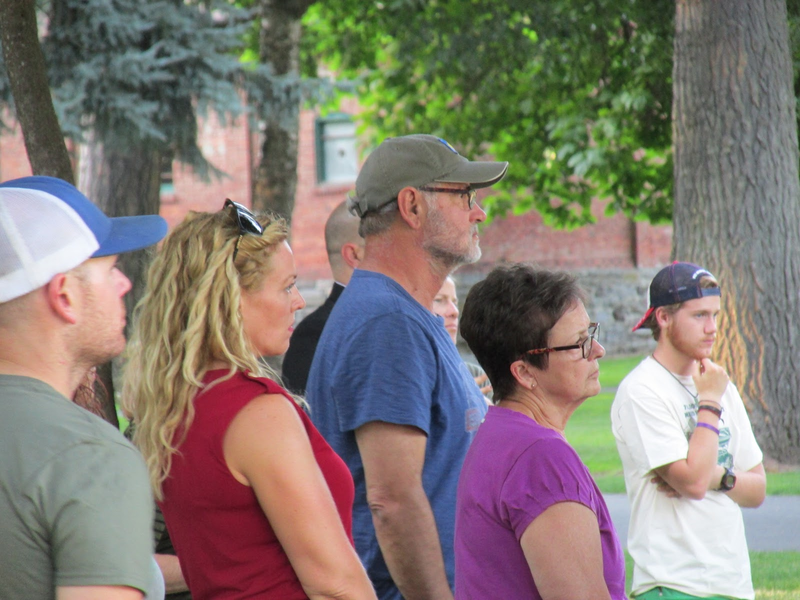 Mayville invited two other locals, as well as audience members to come up and tell their stories. 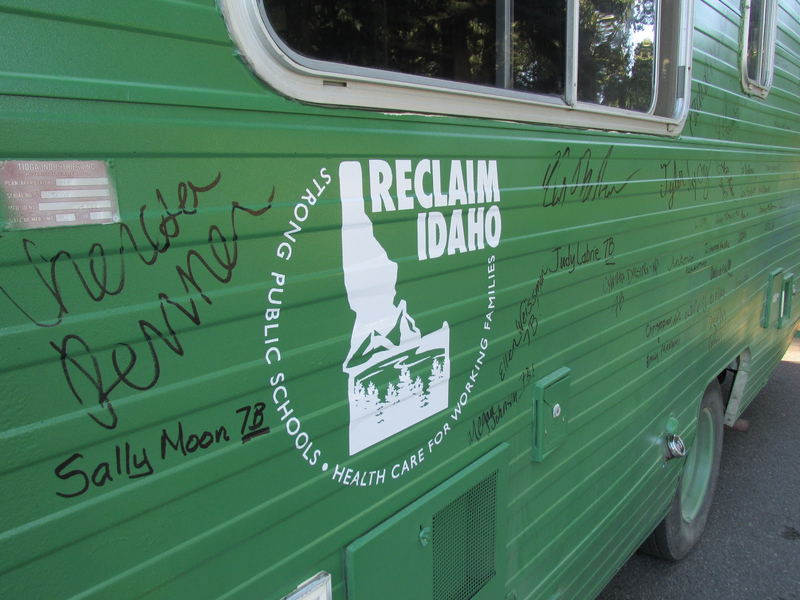 To achieve this, the Medicaid Mobile, adorned with signatures of event attendees, will tour the state with the intention of creating 50 neighborhood teams by the end of August. These teams will make voter contact to support Reclaim Idaho’s values and elect officials who will expand Medicaid to cover 78,000 Idahoans who are currently, and will otherwise remain, uninsured. Luke Mayville addressing the audience. Married Coeur d’Alene natives Mary Foster and Dan Peterson said they supported the goals of the initiative. “I would not be able to retire if not for her medical insurance,” Peterson said. “I’ve always had to make sure I had a job with health insurance, because his employer didn’t,” Foster explained. “I had an autoimmune disorder, a life-threatening one, and if I had to pay for treatment out of pocket, I would still be working five years [past retirement age],” said Peterson. Despite supporting the cause, neither of them had much hope for change. “I believe there is an extreme right constituency in this state, in the Panhandle, but I think they really only win because they organize elections around divisive issues. Issues like guns, abortion and religious identity. If issues were unifying, like public education and affordable healthcare, they would not win. At least not anywhere near the level of success that they have won so far, because they might be able to barely eek out a majority or even eek out a substantial majority when they divide people, but on issues like affordable health care and public education, they don’t hold the majority opinion, and elections have not focused primarily on those issues,” Mayville said. The Medicaid Mobile will be making further stops in Blackfoot, Pocatello, Driggs, Salmon, Cottonwood and more. For more updates on the tour, check out their Facebook Page, or for more information about the campaign visit the Reclaim Idaho website.